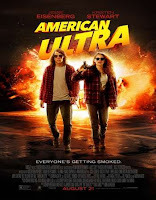 American Ultra 2015 | FunToMovies 300 Movies '+g+"
Story: Small-town stoner Mike Howell (Jesse Eisenberg) spends most of his time getting high and writing a graphic novel about a superhero monkey. What Mike doesn’t know is that he was trained by the CIA to be a lethal killing machine. When the agency targets him for termination, his former handler activates his latent skills, turning the mild-mannered slacker into a deadly weapon. Now, the utterly surprised Mike must use his newfound abilities to save himself and his girlfriend from getting wasted by the failed test subjects that are sent after him by the CIA.